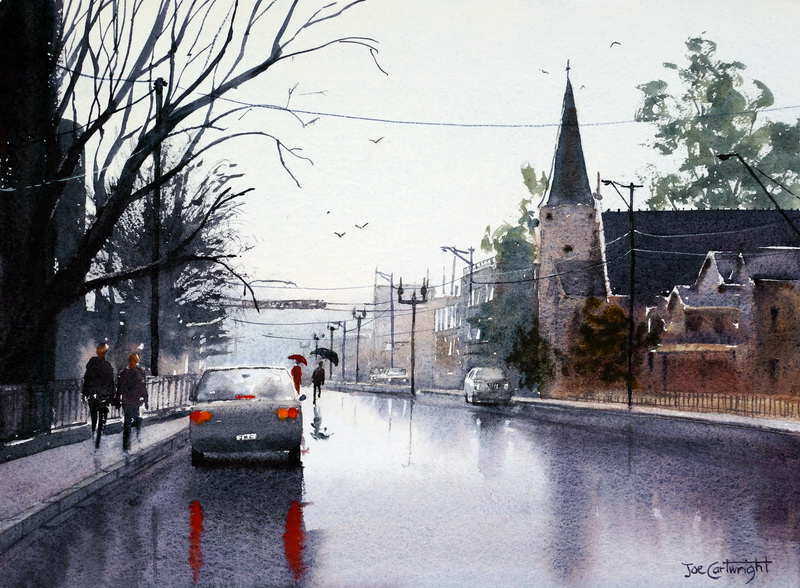 This wet street painting was inspired by a photo I took one morning while I was leaving Bathurst. It had been raining earlier but the rain had stopped and the sun was just breaking through the clouds. I love painting wet weather scenes as it opens up some exciting design possibilities. Here is my reference photo for this watercolor painting. I have obviously made changes to aid my composition. The Church on the right is The Uniting (Methodist) Church. William Street, Bathurst. 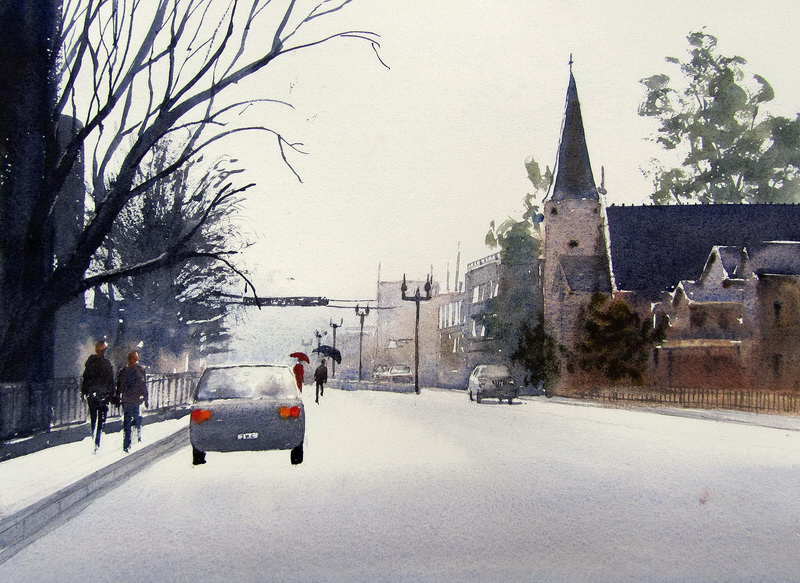 Wet weather watercolor painting: Reference photo of William Street, Bathurst. Watercolor paper: quarter sheet (37cm x 27cm ) of 300 GSM Arches cold pressed paper. Brushes: round, sizes 24, 16, 12, and 8. Rigger. Artist’s quality watercolor paints: French Ultramarine, Cobalt Blue, Permanent Alizarin Crimson, Burnt Sienna, Cadmium Red, Cobalt Turquoise, Raw Umber, and Aureolin. White gouache. All paints are by Winsor and Newton. Old piece of old towel to take moisture out of watercolor brushes. Easel or something to support the board at an angle of about 20 to 30°. Masking tape to fix watercolor paper to board. 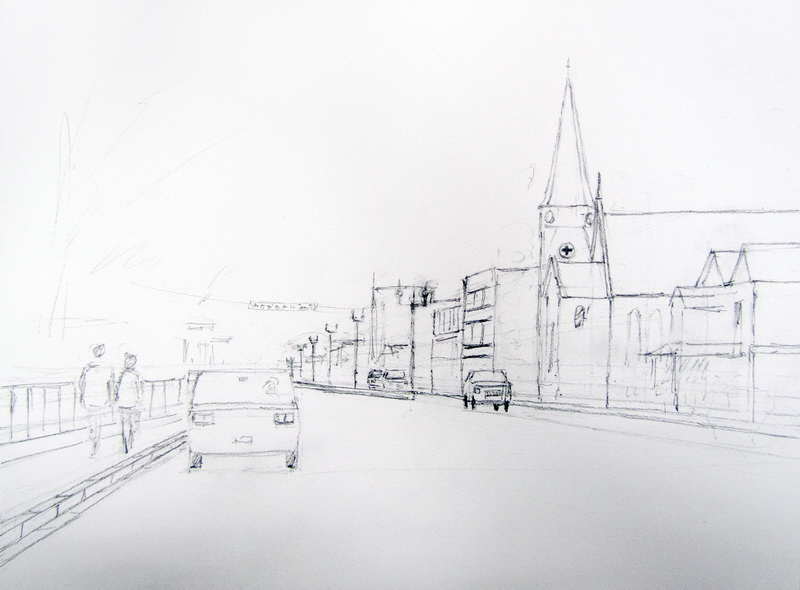 The first step is to draw the street scene. The key point is to start with eye level and then draw your objects relative to that. What do I mean by this? Well, when drawing with perspective, objects above eye level will appear to move down to it the further away they are. While objects below eye level will appear to come up to it as they move away. Another point about eye level which is important is that it basically tells you approximately how tall people are – hence eye level. You can then make all your other objects, cars, awnings, posts, fences, etc. , relative to that height. For the sky I used a weak mix of Cobalt Blue with a little Cad Orange for the warmer parts of the sky. I ran the blue and light orange mix down to the foreground. I painted around the bodies of the main figures and around the windscreen of the two closest cars. While the sky area was still wet I dropped in a mix of French Ultramarine and Alizarin Crimson for the distant hill. I added a small amount of Cobalt Turquoise and Aureolin into the hills to give them a little tinge of green. I used a similar mix, with the addition of a small amount of Burnt Siena, to paint the blue grey surface of the road, making the mix stronger as it came forward in the picture plane. 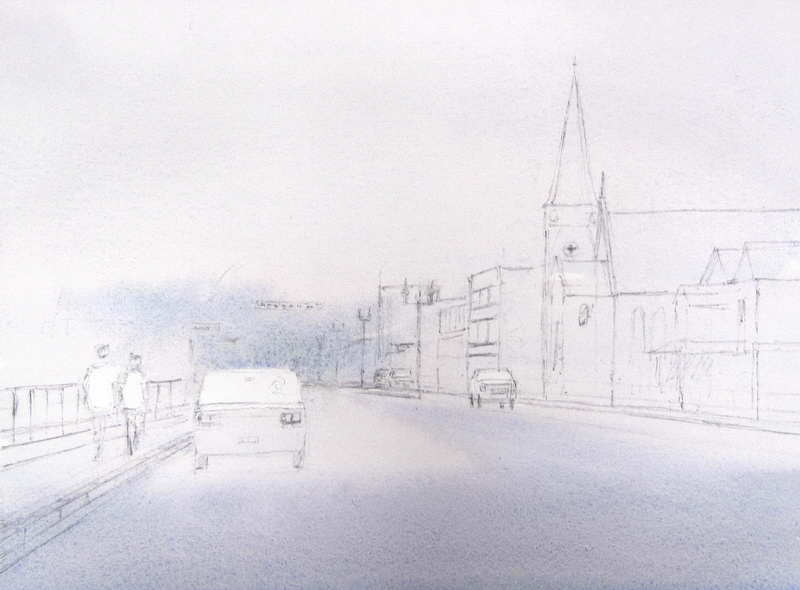 This had to be done while the previous sky based wash was still wet as I wanted soft edges on the road surface. I left parts of the road very light to enhance the impression of a wet street. Under wash for our wet street painting. I let this stage dry thoroughly! Next we paint the buildings on the other side of the road. The watercolors used are French Ultramarine, Burnt Siena, and Alizarin Crimson. Notice how the buildings in the distance are very indistinct with more detail showing progressively as I come forward. The distant colors are also much bluer and lighter. 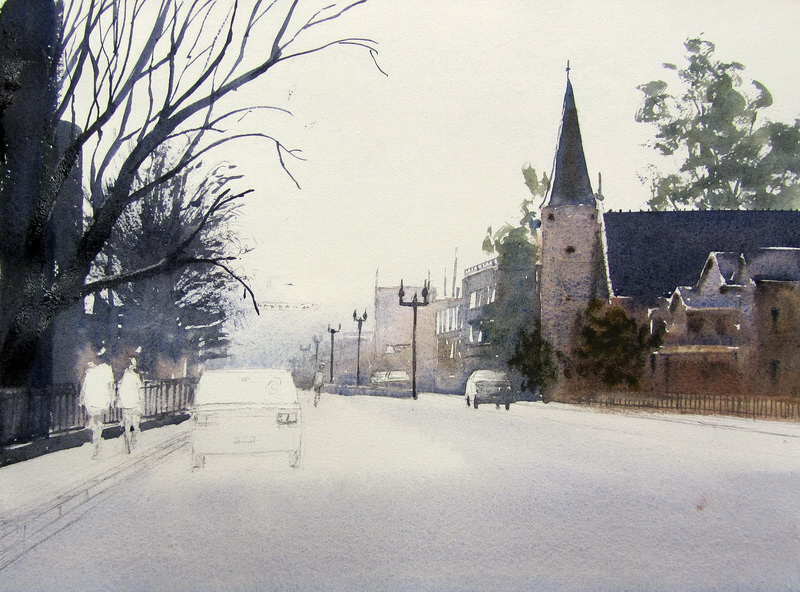 Lightness in watercolor painting is achieve by adding more water to your mix. Even though distant images are barely distinguishable I still kept varying my colors to add interest. Most of the details were left for the church and the building next to it. The distant cars had some of the local building color merged into them to fix them tonally at a particular spot in the picture plane. The trees behind the church were painting with a mix of Cobalt Turquoise, Raw Umber, Aureolin, and some French Ultramarine. Later I used a similar mix to paint the tree behind the horizontial roof line of the church. The buildings on the left hand side are barely distinguishable however I again I used some softer and lighter edges in the distance with stronger and sharper edges in the foreground. This area of the painting was painted with various mixes of French Ultramarine, Burnt Siena, and Alizarin Crimson. Before the vague building shapes are dry I start placing the trees. I used a size 8 round watercolor brush in combination with a rigger brush for the distant tree. Notice how much lighter the distant tree is to the one in the foreground. This is important to create space in the painting. I finished this side of the road by painting the darkest tree with much less water. I used a size 12 round brush for most of the tree with some rigger work for the finest branches. Once this was dry I loosely painted the fence along the bottom. The cars and people are painted next. As they will have their reflections on the wet street you have to paint them before you can do their reflections. I do not dwell on which colors to use for the people and cars. I mix some Raw Umber with Cad Red for the figures heads. For their clothing I just pick colors that will harmonize with the rest of the painting or in the case of the woman in red in the distance a color that will attract the eye and add some interest. The cars are painted with mixtures of French Ultramarine, Alizarin Crimson, and some Burnt Siena. The important thing is not the colors you choose but the tone (how dark or light a color is) of the object. It is tone that mostly gives my painting a feeling of depth, which is what I always try to achieve. I painted the lamp posts and power lines at this time. To finish off this wet street painting we need to add the reflections. 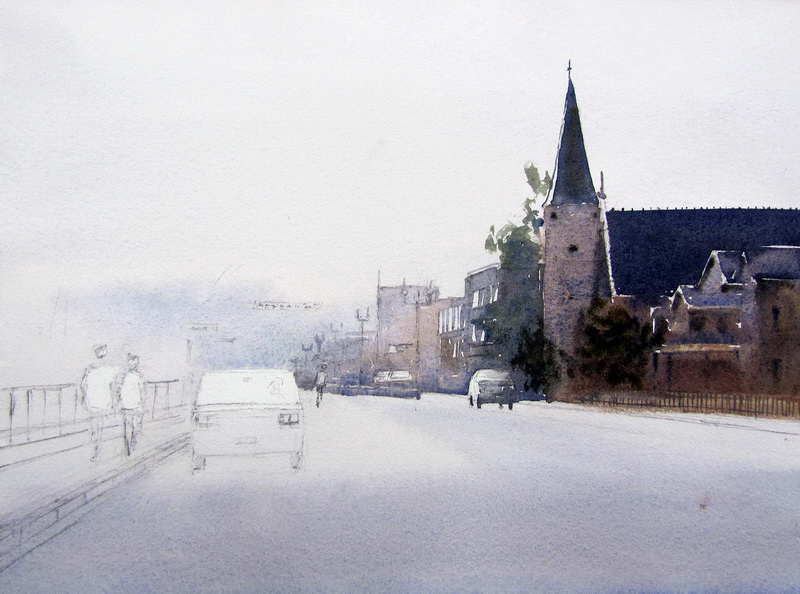 In fact a watercolor painting such as this always feels incomplete until the reflections are done. To paint the reflections I start by mixing the colors for the reflections. This is basically the same mixture as that used for the buildings, people, cars, etc. Once the colors are mixed I wet most of the road surface with clean water. I use a lot of water to do this so that I leave the surface with a shine on it. 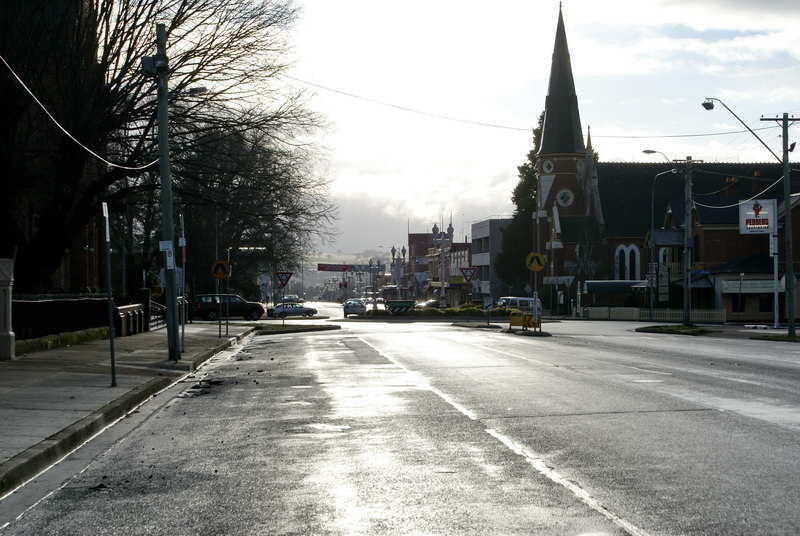 I do leave part of the road dry – under the two people walking across the road and beside the car on the left. This allows me to place some sharp edges under the two figures and beside the main car. I then drop in the reflections and let them run down the page. The reflections should appear directly below the object being reflected but the actual shape does not have to be too accurate as the road surface is not like a true mirror. The road has bumps and undulations on it as well as its own color which combines with that of the reflected color. The reflections also obey the rules of areal perspective becoming stronger in tone as they move closer to the viewer. The reflections of the tail lights are pure Cadmium Red painted into the wet surface. The headlight reflections were done with some white gouache. For the two people with umbrellas I painted their reflections lighter as they were in the distance. After signing the painting it is finished! If you liked this wet street painting demonstration you may like to look at some of my other watercolor painting demonstrations.